Beginning in November and through early December, state government health policy leaders from around the country are heading to Portland, Oregon, Louisville, Kentucky, and Charleston, South Carolina for the Reforming States Group’s three annual fall meetings. The Reforming States Group (RSG) meetings are the hallmark of the group, composed of state health policy leaders from both the executive and legislative branches who, with a small group of international colleagues, gather regularly to share information, develop professional networks, and work on solutions to pressing problems in health care—all while using the best available evidence and experience to improve population health. State delegations—including cabinet officials, Medicaid directors, and elected officers from the same state—will have a chance to sit down together, often for the first time, to work as a team, as they discuss the most pressing issues they face in health policy. These invitation-only meetings are purposefully kept small and confidential, the better to provide a trusted forum for policymakers to candidly share experiences and discuss common challenges. During the state update session of each meeting, participants speak about the most significant health care-related issues in their regions. They learn about each other’s successes and challenges—including the myriad health policy issues facing their states—and have frank discussions about how health policy initiatives advance in a state. The meetings also focus on briefings on a set of health policy topics selected by RSG members—from aging to leadership transitions in an important election year. With the guidance and input of RSG leadership, the meetings start with a half-day seminar on rural health. Some of the rural health challenges states face include concerns about disparities in health status between rural and urban communities, and the declining number of hospitals and resulting reduction in services (e.g., closing obstetrics units). There is also the challenge of training, recruiting, and retaining physicians and other health care professionals in rural areas. At the meetings, participants are learning more about ways to improve the health of rural communities, through telehealth, new delivery models (free-standing emergency departments and community health workers), and payment innovations (including global budgets, which give hospitals clear incentives to manage care within defined budget constraints). Speakers addressed direct-care issues, while encouraging the group to think beyond access. 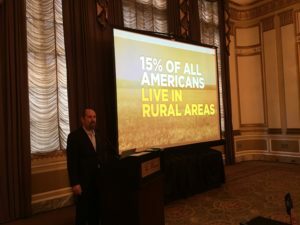 “For years our approach to rural health issues has been to focus on workforce, reimbursement, and access to care,” said Bruce Goldberg, one of the speakers, who is senior associate medical director, Oregon Rural Practice-based Research Network, Oregon Health Sciences University. “Meanwhile, rural health disparities have widened. It is time to develop policies that focus on improving the health of our rural communities and not simply on access to health care.” To that end, participants discussed particular vulnerabilities for youth in rural areas as well as disparities that result from adverse childhood experiences.